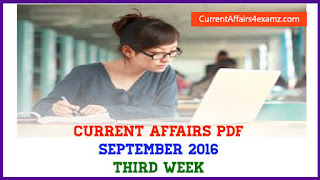 Febraury 2014 Current Affairs Questions and Answers for preparing Exams| Postal assistant| IBPS | SSC CGL 2014| UPSC | Civil Services | Bank | LD Clerk and all other Competitive Examinations. 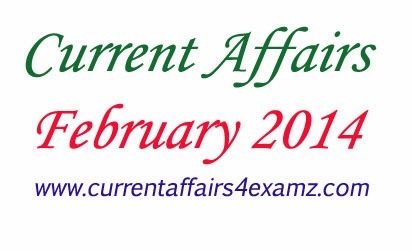 Latest Current Affairs from Last Week of February 2014 in PDF- useful for all competitive Examinations!!!!! Q1. Who won the Gandhi Peace Prize for the year 2013 on 28 February 2014? Note: He is a noted andhian environmentalist and social activist. Bhatt was one of the pioneers of the Chipko movement (His founded Dasholi Gram Swarajya Sangh became the mother-organisation to Chipko movement) for which he was awarded with the Ramon Magsaysay Award in 1982. Q2. India's first electric passenger bus with zero emission level was inaugurated at which city on 28 February 2014? Note: It is an initiative of Bangalore Metropolitan Transport Cooperation (BMTC) with the coordination of Utopia. Initially for trial runs the bus will be used between Kempe Gowda and Kadugodi for 3 months. Q3. India on 28 February 2014 observed National Science Day to mark the discovery of the Raman Effect by Indian physicist Chandrasekhara Venkata Raman (CV Raman). What is the theme of the day for 2014? Q4. Government of India on 27 February 2014 constituted one-man expert committee to study and examine the demand of a separate Bodoland state, which will be carved out from Assam. Who will head the one-man committee? Note: He is the former Union Home Secretary and will submit its report in nine months after consulting all sections of the society on the viability of a separate state. Q5. Name the Indian Navy Chief who resigned on 26 February 2014 taking moral responsibility of the accident on INS Sindhuratna in Mumbai? Note: He is the first Defence forces Chief to resign since independence. Q6. The Committee on New Bank Licenses submitted its report to the Reserve Bank of India (RBI) on 25 February 2014. Who was the head of the Committee? Q7. Nokia announced to launch new series of handset with the use of Android on 25 February 2014. The new phone will be in which series? Q8. The G-20 Meeting of Finance Ministers and Central Bank Governors was held on 22 February 2014 to 23 February 2014 at? Q10. Which batsman of Indian cricket team was on 20 February 2014 appointed as the brand ambassador of the Gujarat State Election Commission? Q11. Who has sworn-in as Italy’s Prime Minister replacing Enrico Letta on 22 February 2014? Note: Renzi, 39 is the Italy’s youngest Prime Minister and he is the third prime minister to reach office without winning an election. Q12. Union Government of India on 28 February 2014 raised the number of workdays under MNREGA (Mahatma Gandhi National Rural Employment Guarantee Act 2005) from 100 days to .... days? Note: This hike in the workdays will benefit 14 lakh families in India and the decision Union Cabinet will come into effect from April 2014. Q13. Union Cabinet on 28 February 2014 approved setting up of a new rail coach manufacturing unit at Kolar in which state? Note: The unit will manufacture 500 coaches per annum at an estimated cost of 1460.92 crore rupees with active participation of State Government. Note: The album was launched by Slaman Khan, the Bollywood actor and the chief guest on the occasion of the release of the album in Mumbai, Maharashtra. Q15. Supreme Court ordered the arrest of the Sahara chief on 26 February 2014. The court ordered his arrest following his failure to appear before it in a case arising out of non refund of 24000 crore rupees to investors by two of his companies. Name the Sahara chief? Q16. Who won the National Billiard Championships held in Lucknow on 26 February 2014? Note: This is the first maiden title for Saurav Kothari since he turned professional in 2007. Q17. Who has been appointed as next Chairman and Managing Director (CMD) of Oil and Natural Gas Corporation (ONGC) on 26 February 2014? Q18. Name the German Chancellor who was awarded with Israel’s highest civilian honour, the Israeli Presidential Medal of Distinction on 25 February 2014 in Jerusalem by President Shimon Peres? Q19. President Yoweri-Museveni of which country signed anti-gay bill on 24 February 2014 which imposes tough penalties for homosexual acts? Q20. National Food Security Act came into force in which state from March 1, 2014? Note: Total population of 75 percent people will be covered under the Act. National Food Security Act in the state is a part of the national Bill that became an Act after receiving the nod by the President of India, Pranab Mukherjee on 10 September 2013. Q21. India and which country signed an agreement on Cooperation in Public and Homeland security on 27 February 2014? Note: The company has also signed an MoU with the Government of Bhutan for a strategic partnership to promote the usage of electric vehicles in the Kingdom of Bhutan. Q23. Name the book on Ambedkar released by Vice President of India M. Hamid Ansari on 26 February 2014? Note: The book was authored by Dr. Narendra Jadhav, a member of Planning Commission. Q24. The largest 130-MW Solar Power Plant of India Welspun Solar MP Project was launched at Bhagwanpur in Neemuch in which state on 26 February 2014? Q25. Hamid Ansari, the Vice President of India on 25 February 2014 released a commemorative postage stamp in the honour of? Note: He was a freedom fighter and an eminent poet. Q26. Who won Protein Science Young Investigator Award for 2014? Q27. Name the world’s fastest car developed by Engineers of US firm Hennessey with a top speed of a speed of 435 kilometers per hour? Q29. Union Government inaugurated the National Centre for Good Governance (NCGG) on 24 February 2014. Its aim? Ans. In guiding and implementing good Governance reforms. Q30. Who was named as the interim President of Ukraine on 23 February 2014? Q31. Who was sworn in as new Egypt Prime Minister on 25 February 2014? Q32. Name the Legendary Spanish guitarist who passed away in Mexico on 26 February 2014 at the age of 66? Q33. Name the renowned Telugu writer who died on 28 February 2014 in Kapada town of Andhra Pradesh? Q34. Union Health and Family Welfare Minister Gulam Nabi Azad inaugurated a new All India Institute of Medical Science (AIIMS) at which city on 26 February 2014? Q35. Supreme Court referred the petition seeking legalization of euthanasia to a ..........judge Constitution Bench on 25 February 2014? Where is 1st and 2nd week February?? 1st week updated kindly check..